Did your mouth just drop open like mine did when I saw it? 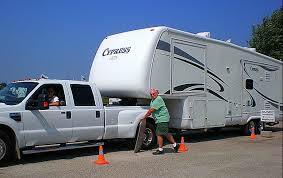 Oh lawd… Well, here are several tips about RV towing to get you going in the right direction. Pardon the pun (snicker). 2. RV Mirrors – Get good ones and large ones and ones with fish-eyes on them. The mirrors are your eyes for everything going on to the left, right and behind you. Check the position they are in before you take off and make adjustments so your view is perfect. In addition to seeing the traffic in the lanes next to you, you should also be able to see your trailer walls and tires when they are adjusted properly. 3. Tires – Check the quality of your tires before going out on the road. It is all that is between you and that hot asphalt so be sure to check everytime you go out. And by checking I mean check the pressure, lug nut torque, and conduct a walk-around just as the airline pilots do before take off, looking at the sidewalls and treads for early signs of wear and tear. 4. Practice makes perfect. Practice driving before going out on the road. Church parking lots are great to practice in since they tend to be quite large and give you plenty of room to maneuver around. Take some traffic cones and set up your lanes. Practice coming to a stop – there’s a lot of weight behind you so know how much space it takes to stop and how it feels behind the wheel while stopping. Practice turning – being in the middle of an intersection during rush hour is no time to try to figure it out. Practice backing up – this will come in handy when trying to get into your space at an RV park and all the other RVers come out with their evening cocktail in hand to watch your skills. 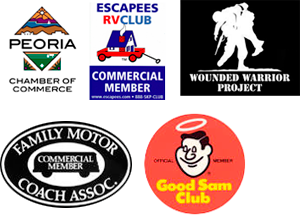 And as always, if you need advice on towing your fifth wheel or trailer, you can always call Fix My RV at 623-875-0515. We focus on excellent customer service – but don’t take our word for it. Read what our customers say about us here.